Hello! I’m thankful it’s already Thursday. There’s so much going on right now in our lives (all new and very exciting) but it can either all fall apart or come together. In one month, we will know where we stand in many departments (professionally & personally). When it rains, it definitely pours. I guess I will leave it up to Fate. I do believe that things tend to fall where they are supposed to. Just when you feel like you’ve had enough of something, a new opportunity comes knocking on your door. In the end, it always work out. But first things first…I’m so looking forward to our Europe Vacation in just a week! We are heading to multiple destinations in France, Italy, and Portugal. It’s going to be a fabulous family adventure. From city hotels in Paris to farm stays in Tuscany, we’ll get to experience it all. Very grateful for this opportunity. Here’s how I enjoy my mini-muffin. Because I’m fancy like that. And you can be too! Just insert a mini-muffin into a cappuccino cup. Wouldn’t this be great to serve at little tea + pastry parties? Gorgeous purplish blue + white hydrangeas from our garden. My current nail color. 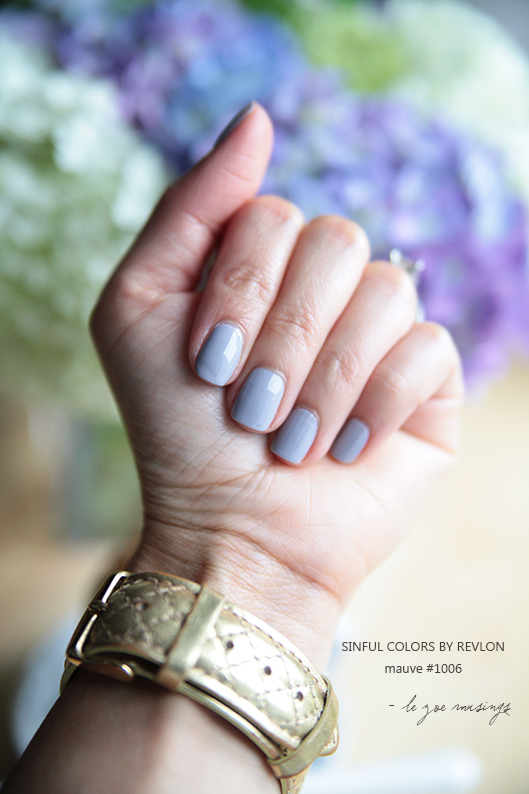 A touch of lavender and tiny hints of gray make for a perfect shade to wear during these cool, partly dewy, party cloudy summer days. Have a great day. And remember…when things don’t go your way, it’s b/c it’s not meant to be. It’s healthier to pick up and move forward then sulking over it (although you’re allowed to do so for about 2 mins!). Can’t move on until you let go. I’m living on that ideology a lot nowadays. Meant to be. I like that expression. It’s comforting. Hello from London, Kellie!!! I absolutely adore your blog, your pictures are so delightful! Thank you for following my blog and thus giving me the opportunity to discover yours! I wish you a very lovely and adventurous holiday, enjoy the Mediterranean! I love Portugal, the people, the language, the culture (be sure to visit a fado night in Alfama! :)), the food (bacalhau in its myriad forms, sardinhas, vinho verde, bica com cherinho… :)) … A beautiful place. amazing pictures makes the muffin look even more scrumptious. Very pretty and zen. Good for you for enjoying the little things! Good luck with the life changes. It’s impossibly hard to think about all the opportunities when only bad things seem to be happening sometimes, but you surround yourself with the beauty in life and I’m sure it’ll be coming back to you quickly! wow, I love how something so simple can be made so beautiful and fancy. Thanks for the idea! THANK YOU, Reading your POST, Is exactly where I am & need to be right now. ‘Hitting the balls yes, But turning it over to a higher force bigger than you & me? Perfect for breakfast with a cup of chocolate… Like your nail polish tho! Oh Europe, i love it! Please take lot of pictures so I can live vicariously through you! Love how you served the mini muffin! That’s so important to remember — to always move forward. It’s so easy to forget, and much easier to settle and dwell in the negative. The only way things can change is if you make a change. I’m learning that myself right now. Beautiful post. That, too, is my favorite nail color. Such a great reminder, Kellie! Thanks for posting! Well I appreciate you being fancy like that!! 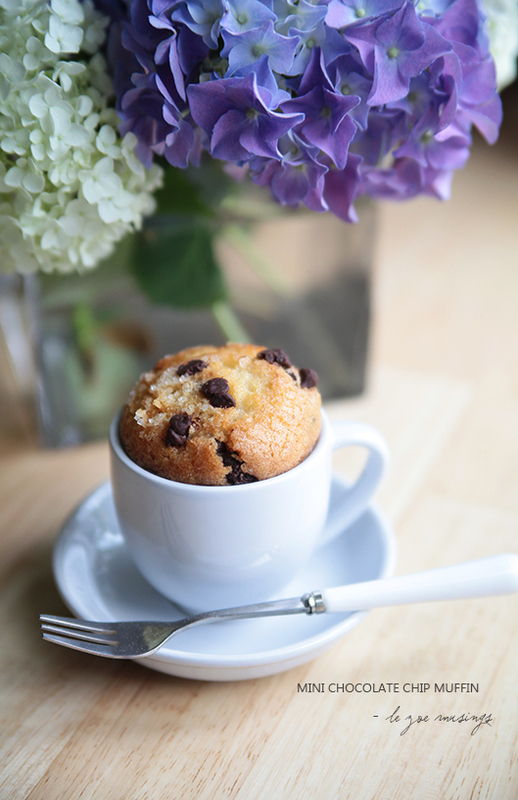 I LOVE the idea of serving a mini muffin in a little teacup. I actually thought you had baked it in the cup. Very pretty indeed. Looking forward to pictures from your travels! !